This book was brought to my attention thanks to the Cybils Awards. In 2010 it won the short chapter book category. Freddie and his mother have recently moved to Starwood Park Apartments. One day Freddie Ramos comes home to find a box with his name on it. Inside is a new pair of purple sneakers. 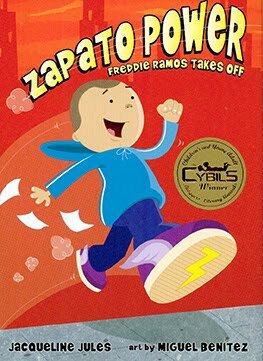 There's no name with the gift, just a note saying Zapato power for Freddie Ramos. With his new shoes, Freddie is very fast, faster than a train. Freddie wants to use his new speed to be a hero. He also knows me must keep is Zapato power a secret. This was a very fun read. Freddie Ramos is great. He's just an ordinary boy who is given a special gift. This is easily my favorite early chapter books I've read in a while. I love that it features a male protagonist of color. I checked out the first book from the library. I figured I'd only meet Freddie but now I am looking forward to reading the other books in the series. The chapters are only about eight pages long with illustrations. Jules text and Benitez art, make this a very relucatant reader friendly.